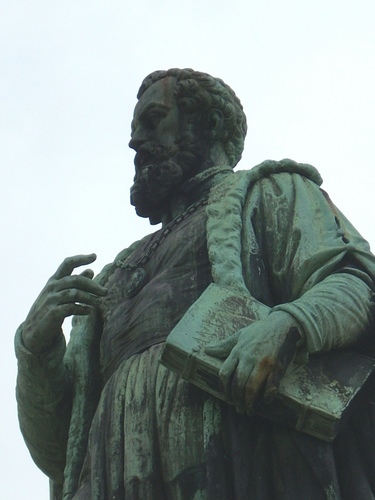 This monument to Andreas Vesalius was erected and dedicated on December 31, 1847. The big bronze statue stands in the middle of Place des Barricades, in Brussels. The scientist keeps in his left hand a big book on which the word "ANATOMY" can be read. On the basament - a work by Hector Goffart1 - there are two inscriptions lacking some bronze letters. 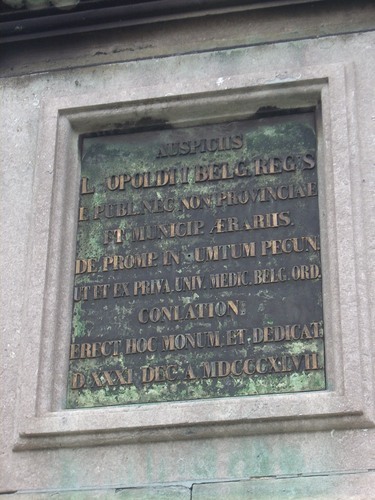 The first one: "AUSPICIIS / L[E]OPOLDI I BELG. REG[I]S / E PUBL. NEC NON PROVINCIAE / ET MUNICIP. AERARIIS. / DE PROMP. IN [? ]UMPTUM PECUN. / UT ET EX PRIVA. UNIV. MEDIC. BELG. ORD. / CONLATION[?] / ERECT. HOC MONUM. ET DEDICAT. / D.XXXI DEC. A. MDCCCXLVII". The second one: "ANDREAE VESALIO / SCIENTIAE ANATOMICAE / PARENTI. / —- / NATUS BRUXELL. D. XXXI DEC. MD[X]IIII / NAUFRAGUS IN JACYNTHO / OBI[I]T D. XV OCT. MDLX[I]III". 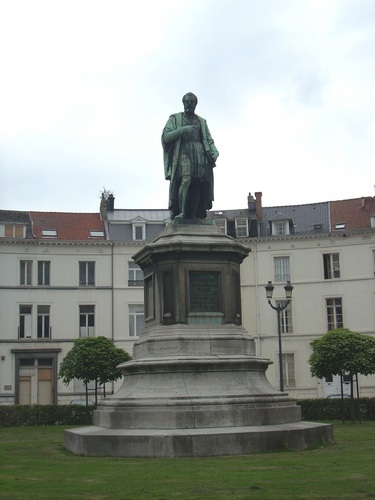 The renowned american surgeon Samuel David Gross left a moving account of his visit to the monument (1869) in his Autobiography: "One of the most interesting objects in Brussels to a medical man is the bronze statue of Vesalius, erected under the auspices of Leopold I., in the Place des Barricades. The figure is beautifully posed, and is arrayed in a flowing robe, with pen in hand and a folio volume under the left arm. 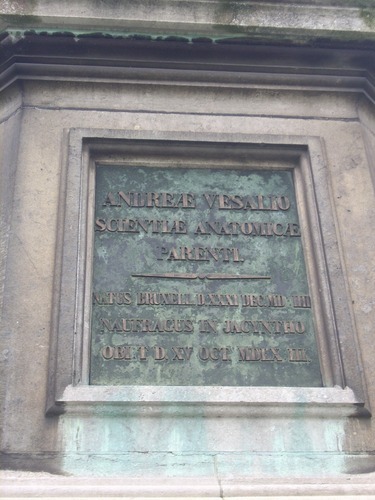 Underneath, on the pedestal, is the inscription: ' ' Andreae Vesalio, Scientiae Anatomiae Parenti:' ' (To Andrew Vesalius, the Father of the Science of Anatomy.) It is an honor of no ordinary character that a king, absorbed in the cares and duties of statescraft, should have turned aside to prompt the erection of such a memorial in honor of a member of the medical profession"2. 1. On the basament there is the following latin inscription "STYLOBATAM FECIT HECTOR GOFFART". 2. Samuel D. Gross, Autobiography, with reminiscences of his times and contemporaries, Saunders, Philadelphia 1893, vol. I, p. 268.